It’s been years of dreaming and months in the making. Today, we’ve finally pulled the covers off “Deep Lead Search” within LeadFuze. I’ll get to Deep Lead Search in a minute, but I wanted to share some more high level details. We recently made the move to focus solely on data (versus data + cold email). This was a big decision, but it was with the idea that we wanted to focus on the one thing most people come to us for and we wanted to be the best at it. We knew what we were working on (the Deep Lead Search and just overall data acquisition) would allow us to make this transition. The first thing we decided to do, was announce our unlimited leads plan. All the while, we’ve been making major data partnerships and completely rebuilding our entire database of contacts (we call this our lead pool). Not only adding records, but also completely improving the verification process to give you the freshest data. With this release, we’ve gone from roughly 5 million companies and 70 million or so total contact records to over 20 million companies and 300 million contact records, with over 100 million having emails, and over 50 million with phone numbers, and all of them with at least one social media profile. Check out LeadFuze and get 25 leads free! So What is Deep Lead Search? Simply put, Deep Lead Search allows you to get much more targeted with your prospecting. Not only did we add hundreds of millions of records, we have much more data on these records. Allowing you to search like never before. When you’re after multiple contacts within an industry or role, or things like technologies used or dynamic events like hiring, company news, or even by Adwords budgets… we call this “Market Based” search. So imagine if you wanted the Founder of a technology company in Boston that’s less than 200 employees, who might be hiring a software engineer, that recently had a product launch, who is spending more than $1,000 per month on Adwords, that is currently using WordPress… oh, and you want to avoid any records you or your team already have in your CRM and you want to skip any current email subscribers or competitors. Well, that’s now possible with Market Based search. 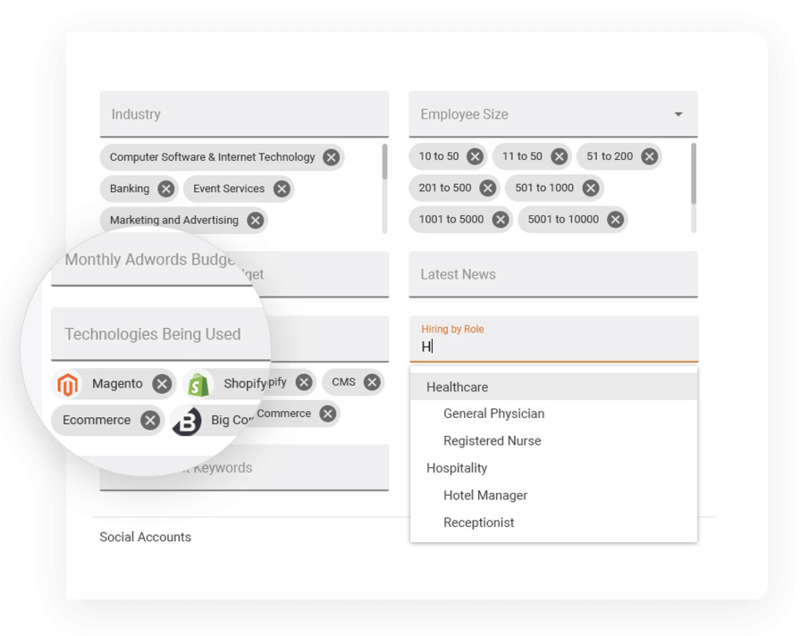 Ever need to look for people in a certain role within specific target accounts? Or maybe just for a specific individual at a company? Welcome to the new Account Based search option. Say you have a list of 100 dream target accounts and you need someone in charge of Finance. 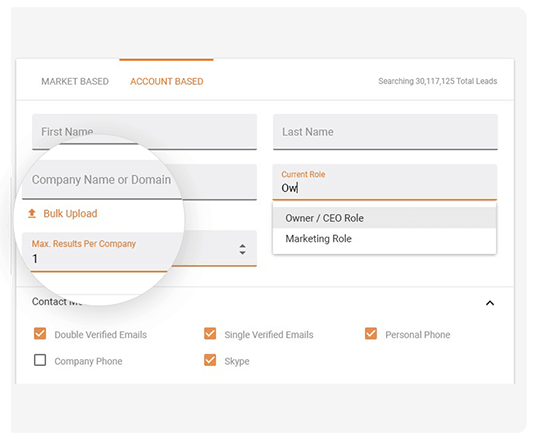 You can upload your list of company names or domains (or select the companies individually if you want), then input your target roles and instantly see all the perfect contacts for your dream accounts. Leads are no longer just static from our lead pool. You can save your traits for things like company news, if companies are hiring, certain technologies are installed, etc. Your results might have 10,000 or so at the time of your search, but as Fuzebot (our A.I. powered sales assistant that does all the heavy lifting for you) crawls the web and collects data from our partners, he’ll automatically update your lists for you with the new leads that match this criteria.